It was a dramatic year for superhero and mainstream comics. Marvel gained incredible momentum with its Marvel Now! publishing initiative while DC’s quality dipped as it continued a trend of New 52 homogenization, revealing that creative diversity is the key to keeping superhero titles captivating to older readers and accessible to newcomers. With a revamped superhero line and a rise in profile for creator-owned books, Dark Horse became Image’s top competitor in the realm of alternative ongoing comics, but Image still pulled ahead with an impressive string of extraordinary new releases. Here are The A.V. Club’s picks for the top superhero and mainstream comics books of an exceptional year. A crime noir with a supernatural twist, Dream Thief makes scumbag John Lincoln a vessel for vengeful spirits when an Australian aboriginal mask comes into his possession, sending him down a dangerous path that starts with the murder of his wife and only gets worse. John wakes up with new blood on his hands every time he falls asleep, a condition that never fails to land him in an uncompromising situation and leads to some great cliffhangers over the course of the five-issue miniseries. Jai Nitz’s script keeps just enough information from the reader to build suspense, forcing the audience to feel John’s disorientation before clearing up the events that have transpired during the blackouts. Nitz crafts a gripping plot that’s magnificently realized by Greg Smallwood, who approaches page design with a graphic flair that beautifully serves the story while providing immense visual variety. While Jeff Lemire has done some astounding course correction on Green Arrow to make it one of DC’s top titles, his most exciting work in comics this year is the one he also illustrates. Trillium is a time-travel romance that brings two lovers together across thousands of years, one a traumatized World War I veteran, the other a scientist in the year 3797 trying to find the trillium plant that will save the dying human race. Lemire moves out of his comfort zone to build the book’s sci-fi future environment, and his experimentation with panel structure brilliantly informs the narrative. The first issue’s flip-book presentation allows the two individual stories to begin at opposite ends and intersect in the middle as the lovers meet, and the symmetry in the layouts establishes that the two protagonists have the exact same rhythm to their lives. Each issue finds Lemire pushing himself in new ways, proving that his solo work is where he reaches his full creative potential. The first year of Fatale was a thrilling fusion of crime noir and Lovecraftian horror, but the book really took off in 2013 as it explored the titular femme fatale, Josephine, and her curse. This year, Fatale had writer Ed Brubaker returning to his ’90s Seattle roots. The time-jumping stand-alone stories in #11-#14 begin with a young Josephine meeting a stand-in for H.P. Lovecraft, a metafictional Depression-era tale followed by three issues that show the creative team taking influence from the Western, war, and medieval-fantasy genres. That diverse assortment of narratives showcases the versatility of the book’s central concept, giving Brubaker and artist Sean Phillips the opportunity to play around in the sandbox they’ve created before returning to the gritty blend of crime and horror that defines the main story. Those Seattle grunge rockers never stand a chance once they fall prey to Jo’s demonic charm, and Brubaker doesn’t let his nostalgia for the time period lessen the brutality of their sad fates. By avoiding the influence of the greater DC universe, Brian Azzarello and Cliff Chiang’s Wonder Woman has maintained outstanding momentum since its debut. Wonder Woman may be dating Superman, but that forced romance doesn’t gel with Azzarello’s characterization of Diana, so it’s ignored in favor of an antagonistic flirtation between Wonder Woman and New God Orion, an addition to the supporting cast that spices up the group dynamic and moves the title in a more Jack Kirby-inspired direction. Azzarello proves adept at folding the mythology of the New Gods into his overarching narrative, using Wonder Woman and Orion’s strange family histories to bring the two warriors together, and major status quo shifts keep the stakes constantly rising, like Diana becoming the God Of War after the death of Ares. Cliff Chiang’s artwork brings a chic modernity to Kirby’s New Gods designs, while the King’s influence shines through in dynamically staged action sequences, and the fill-in art team of Tony Akins and Goran Sudzuka keep the visuals tight in Chiang’s absence, making Wonder Woman one of DC’s most stylish titles. Ales Kot carved out quite a niche for himself writing espionage action comics this year, with a short-lived run on DC’s Suicide Squad, a co-writing gig on Marvel’s Secret Avengers, and Zero, the ongoing Image series that pairs him with a different artist each month. The shifts in art coincide with jumps in the title character’s timeline, immediately establishing the change in tone with each new collaborator: Michael Walsh’s thick inks and forceful fight choreography capture the grisly intensity of a Gaza Strip smackdown between two fighters augmented with biotechnology; Tradd Moore’s tight, dynamic linework and animated characters bring a youthful energy to an integral moment in Edward Zero’s childhood; and Mateus Santolouco’s sharp design and smooth pacing heighten the opulence and tension of a chapter set in neon-drenched Shanghai. (Colorist Jordie Bellaire unifies the disparate visual styles.) Each issue is an invigorating stand-alone tale spotlighting a distinct artistic voice, providing glimpses of an overarching narrative without sacrificing any immediate momentum. 15. Mark Waid, Chris Samnee, et al., Daredevil (Marvel) Now in its third year, Mark Waid’s Daredevil is Marvel’s most consistent comic book, guaranteeing a visually stunning superhero tale that balances a classic sense of fun with a realistic perspective on personal hardship in each issue. This year, the Man Without Fear confronted the villain manipulating him since the start of Waid’s run and faced off against a hate group that had infiltrated New York City’s political system, all while his best friend Foggy Nelson fought for his life undergoing treatment for Ewing’s sarcoma. Foggy’s journey proved to be especially memorable, with Waid making him the center of stories that spotlight the power of superheroes to provide faith and hope in a harsh, unfair world. 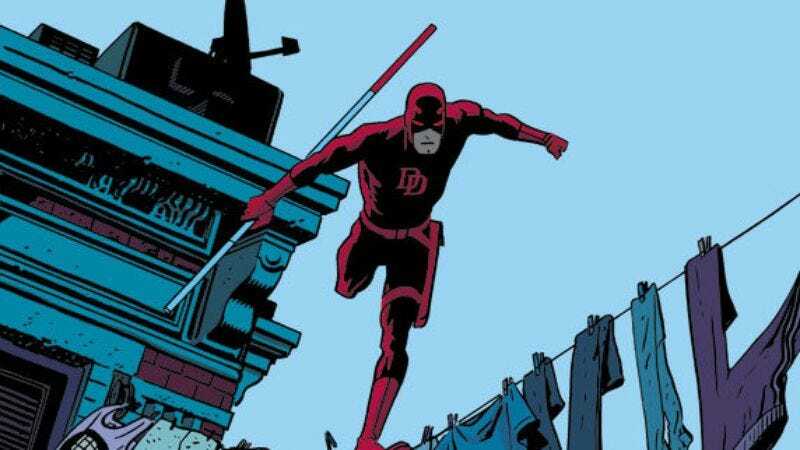 Chris Samnee’s artwork immerses the reader in Matt Murdock’s world with detailed environments and characters, and the influence of master cartoonists like Alex Toth and David Mazzucchelli shines through in his dynamic layouts. Marvel may have released a high-profile cosmic crossover this year, but Brandon Graham’s Prophet stands strong as the most epic space-opera in comics. Working with co-writers Simon Roy and Giannis Milonogiannis, Graham has shifted to more serialized storytelling as the rebirth of the Earth Empire speeds along, spending less time on atmospheric self-contained tales to expand the scope of the central sci-fi narrative. The world-building on this title is particularly impressive, regularly introducing new locations and characters without feeling the need for hefty exposition. Instead, Graham lets the artwork do the explaining, trusting the reader to draw conclusions based on visual context clues. Roy and Milonogiannis handle the majority of the art as they cover opposing sides of the stellar conflict, but the book has become a spotlight for alternative cartoonists, shining brightest in the artistic jam session that is Prophet #39. The biggest surprise of the Marvel Now! publishing initiative has been Simon Spurrier’s ingenious character study of David “Legion” Haller, the son of Charles Xavier who has to live with an army of super-powered alternate personalities running around his brain. After the death of his father, David dedicates himself to making Xavier’s dream of human-mutant coexistence a reality, taking proactive steps to ensure the survival of the mutant race while fighting to control the chaos in his mind. Spurrier’s exploration of David’s external and internal struggles makes Legacy the year’s most personal and idiosyncratic X-book, using David’s fractured mental state to provide a unique perspective of the ongoing mutant conflict. Artist Tan Eng Huat offers an unconventional take on Marvel’s mutant population, and his psychedelic interpretation of David’s mindscape lends a surreal quality to the title that distances it from the usual superhero fare. All it took was the death of Hellboy to finally get Mike Mignola back drawing the adventures of his signature character. Hellboy In Hell is the triumphant return of one of the industry’s most visionary cartoonists, set in an environment that allows him total flexibility to stretch his creative muscles. The past few years of Hellboy stories told a riveting horror-fantasy epic, but this new ongoing series sees Mignola focusing less on plot and more on creating an immersive visual experience. There’s major action unfolding in the underworld now that Hellboy has returned, but these events are relegated to the background in favor of smaller-scale stories that show the human side of the inferno. Mignola’s gothic design sense creates a nightmarish landscape of collapsed buildings and bleak city streets, a recognizable urban environment given an alien quality by Dave Stewart’s unconventional color palette. The scripts are light on dialogue, but the haunting artwork pulls the reader in and makes hell a tough place to leave. Image’s sci-fi ongoing is one of the best places to find wildly imaginative design work from Fiona Staples, but no matter how weird the characters and locales get, Saga always strives to find the relatable human emotions motivating the fantastic story. Brian K. Vaughan’s dialogue has a pace and sense of humor that is closer to an HBO comedy than hard science fiction, and his plot ignores genre tropes to offer a more grounded story about two lovers learning how to start a family in a galaxy far, far away. The interstellar conflict at the root of the series is nowhere near as the intriguing as Alana’s reaction to having her in-laws move in with her, and the juxtaposition of extraordinary genre elements with everyday personal conflict is one of this book’s biggest strengths. That dichotomy also shines through in Staples’ beguiling artwork, bringing a contemporary fashion sense to the alien universe for added hipness. When it comes to crafting a compelling hook, few comics can match Frank J. Barbiere and Chris Mooneyham’s new Image title about a daring thief/treasure hunter possessed by the spirits of five literary characters: Dracula, Sherlock Holmes, Robin Hood, Merlin, and Miyamoto Musashi. Thanks to the mystical Dreamstone, Fabian Gray uses the extraordinary skills of these spirits in his quest to find his lost sister, and that assortment of literary legends showcases the wide array of influences on Barbiere’s script. A miniseries-turned-ongoing, Five Ghosts began as a pulpy action-adventure series, but has expanded into the realms of fantasy horror and martial-arts thriller as Gray’s journey takes him to exotic new locales. With a style that combines the intricate linework of Kevin O’Neill with the raw dynamism of Joe Kubert, Chris Mooneyham’s art impeccably flows from the splendor of a majestic landscape to the quick-moving intensity of a fight sequence, providing visuals that are as well rounded as the writing. Marvel’s decision to have Doctor Octopus take over the mind and body of his archenemy in the pages of Dan Slott’s The Superior Spider-Man was one of the year’s most controversial developments in superhero comics, but the increased profile of the web-slinger has made books like The Superior Foes Of Spider-Man a possibility. Writer Nick Spencer and artist Steve Lieber have created a supervillain-centric title fusing a high-stakes crime story with a hilarious ensemble comedy, making for a comic that delivers equal amounts of shocks and laughs, especially in its casting of the Sinister Six as a group a down-on-their-luck costumed hoods who are as likely to be foiled by their own ignorance as any costumed opponents. Spencer’s irreverent dialogue and Lieber’s grounded visual style garnered immediate comparisons to Hawkeye, but the supervillain perspective and overt focus on humor help set Superior Foes apart. Lieber fills the book with visual details that keep the mood light, and his characters are versatile comedians that nail Spencer’s punchlines. This title makes it easy to root for the bad guys, and like Hawkeye, it’s a great gateway into the daunting world of superhero comics. Jonathan Hickman expanded the scope of the Avengers and pitted them against a slew of cosmic threats this year, but his strongest ongoing work remains his two creator-owned Image series. While The Manhattan Projects continues to twist history in delightfully gruesome ways, Hickman’s sci-fi Western with FF collaborator Nick Dragotta finds the writer stretching his imagination across multiple genres to reach new levels of excellence. East Of West has a stronger attention to character than Hickman’s other titles, which have a tendency to let high-concept plots overtake emotional development. Imagining Death of the biblical Four Horsemen as a Western gunslinger on a quest to avenge his wife and child in a high-tech future is certainly a high concept, but Hickman’s emphasis on Death’s relationship to those he’s lost makes the former Horseman a sympathetic antihero. Combining the grit of a traditional Western with slick, polished sci-fi designs, the art team of Nick Dragotta and colorist Frank Martin create a future environment where there’s a vast gap between nature and technology, and Dragotta’s passionate character work heightens the poignant moments in Hickman’s script. The ending of Locke & Key was always going to be ugly, but few could have predicted the devastation of the book’s final issues. (Alpha #2 hits shelves on December 18.) Keeping with the tradition of teenage horror stories, the forces of darkness make their big power play on the same night as the school dance at Lovecraft Academy, which offers plenty of teenage flesh to feed the hordes of hell when the late-night festivities move to the Drowning Cave. Over the course of that fateful evening, Hill puts each cast member in increasingly disastrous situations that offer little hope for escape, creating a suffocating atmosphere of fear that grows with each new chapter. Those terrifying moments are realized in vivid detail by artist Gabriel Rodriguez, who pulls no punches when staging a bloodbath or showing the emotional impact of these traumatic events on the characters, delivering a hard-hitting final act to one of the best horror comics of the past decade. One of the strongest developments of Jonathan Hickman’s Fantastic Four run was the introduction of the Future Foundation (FF), a think tank of brilliant young minds from across the Marvel Universe that learned and lived together in the Baxter Building. Tasked with FF’s Marvel Now! relaunch, writer Matt Fraction and artist Michael Allred have turned the title into a fascinating exploration of unconventional family dynamics that also serves as an all-ages love letter to the Marvel Universe. Fraction’s stories mine classic issues of Stan Lee and Jack Kirby’s Fantastic Four for inspiration, incorporating Silver Age silliness into a narrative that isn’t afraid to delve into some serious issues, like Scott Lang’s guilt over not being able to prevent the death of his daughter. Artist Michael Allred and colorist Laura Allred bring a delightful retro energy to the story, with Michael doing exceptional work depicting the restless body language and facial expressions of the book’s younger cast. Fraction has handed over scripting duties to Michael’s brother Lee Allred for the remainder of the run, and the book’s fun-loving vigor has only intensified now that it’s an Allred family affair. When writer Charles Soule took over Swamp Thing, the horror title had lost most of its steam during a crossover with Animal Man that dragged on for far too long. With his first issue, Swamp Thing #19, Soule dramatically re-energized the title by accentuating one specific idea: Nature is scary. The title character found himself struggling with the conflicting human and plant sides of his personality, and the bloodthirsty voice of the Green constantly whispering in Alec Holland’s head heightened the psychological horror of the title. Soule has done remarkable work with guest stars like Superman and John Constantine (easily writing the New 52’s best Hellblazer), but the most impressive aspect of his run is the expansion of the book’s mythology, introducing former plant heroes who assist Swamp Thing as he faces off against new foe Seeder. Featuring lush artwork by Kano, Jesus Saiz, and Javier Pina with atmospheric colors by Matthew Wilson, Charles Soule’s Swamp Thing has an incredibly confident creative voice, paving new ground with a character that was once synonymous with progressive storytelling. Vertigo’s future seemed dim at the start of the year, but then Kurt Busiek and Brent Anderson’s long-running superhero series reappeared to become a beacon of hope for DC’s mature-readers imprint. The debut of an ongoing Astro City title opened the doors for a wave of new Vertigo books, and after almost 20 years of publication, it remains the most accessible superhero book for both new readers and enthusiasts. There’s plenty of bombastic costumed action in every issue, but Busiek’s stories are focused on the effect those fantastic events have on the regular citizens of the titular metropolis. This year’s central civilians included a middle-aged man who becomes Earth’s ambassador to a giant cosmic being, an eager young woman working as a call-line operator for a superhero team, and a group of gifted humans that chooses to live on the sidelines. Their stories are imbued with a heavy dose of realism from Anderson’s art, which smoothly transitions from intimate character moments to widescreen spectacle as Busiek’s scripts twist and turn in unexpected directions. Two words: Pizza. Dog. Matt Fraction and David Aja’s groundbreaking superhero title was already Marvel’s strongest comic when Hawkeye #11 dropped in June, a highly experimental story about a crime-solving canine that also stands out as the best single issue of the year. Told from the perspective of Clint Barton’s dog Lucky (a.k.a. Pizza Dog), “Pizza Is My Business” uses minimal dialogue and introduces information through icons that correspond to specific smells in Lucky’s memory. It’s a brilliant spin on the hard-boiled mystery that spotlights Aja’s willingness to test the limits of his art and create a unique reading experience. That kind of quality takes time, and a group of fill-in artists helped remedy some of the book’s chronic lateness in 2013: Steve Lieber and Jesse Hamm started the year with an inspiring Hurricane Sandy issue; Francesco Francavilla drew two stylized stand-alone tales; and Annie Wu became a regular addition to the art team, alternating issues with Aja as the story split time between Hawkeyes on different coasts. Now firmly in its second year, Hawkeye has established itself as the must-read superhero title, pushing the boundaries of the medium while exploring the personal ramifications of the super life on a regular Joe. The crew of the International Space Station has been exposed to a mysterious biochemical agent, and when they return to Earth, they come back… different. It may sound like the origin of a superhero team, but the stylish execution of writer Eric Stephenson and artist Nate Bellegarde’s sci-fi ongoing series makes it nothing like the traditional superpower plot. The plight of the World Corp I.S.S. employees is only half of Stephenson’s story, which delves into the Beatles-esque past relationship of the four World Corp founders to build an extensive history in just six issues. Much of this information comes courtesy of magazine articles and book excerpts, which not only flesh out the book’s setting, but also create tension by affecting the pacing between scenes. Bellegarde’s widescreen layouts give the book a highly cinematic look, bolstered by his meticulous eye for detail and a talent for intensely expressive characters, and the visuals are elevated by Jordie Bellaire’s nuanced coloring and Fonografiks’ slick lettering and design work. The first year of Nowhere Men was plagued by delays, but the wait wouldn’t have been nearly as difficult if the book wasn’t so damn good. What Matt Kindt accomplishes on a monthly schedule in the pages of Mind MGMT is mind-blowing, but it’s even more impressive considering Kindt’s increasing superhero output as a writer for Marvel, DC, and Valiant. Kindt has never let the quality or shipping schedule of his experimental creator-owned series slip as his capes-and-cowls work builds up, writing and drawing each issue of a spy epic that has quickly become one of the industry’s most unpredictable stories. The second year of Mind MGMT saw Kindt further develop the complex mythology of the titular psychic organization, expanding focus to the supporting characters that have become vital players in Meru’s quest to uncover the truth of her past. Their extraordinary abilities allow Kindt to show off his mastery of the comic-book medium by playing with the relationship of words and pictures, reflecting the cast’s extrasensory experiences through unconventional storytelling techniques. Striking the perfect balance of high-concept narrative, personal drama, and visual innovation, Mind MGMT is a comic that doesn’t let go once it grabs hold of your brain.